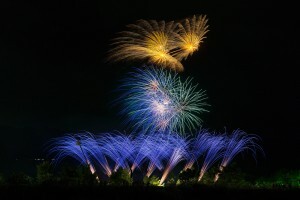 Numata Firework Festival originally began in Numata City, Gunma Prefecture. 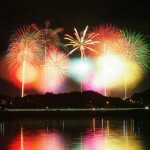 The festival is brought by Firework maker, “Marutama-ya”. 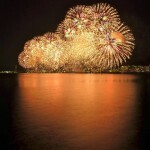 Marutama-ya has won prizes at the major firework competitions all of the world. Time: 7:00 P.M. ~ 7:45 P.M.
Before the fireworks, there are many events that you can enjoy such as Flair Bartending Show, Japanese drum performance, dance performance, etc. There are also food stalls where you can enjoy food and regional specialties. Firework is, of course, the main highlight of the event. Firework maker, “Marutama-ya” use computer programs to launch fireworks together with music, delivering state-of-art firework show. A combination of 10,000 fireworks and music, creates a musical-like show, making watching firework much more interesting than ever. Children of three years and under do not need tickets. People who purchase the ticket can reserve Japanese meal-box. Please check the meal selection from this site. 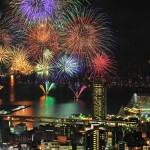 ・If the firework festival is postponed, you cannot get a refund for the ticket.